Happily, DeLallo produces a whole line of gluten-free pastas, including this classic, tiny shape. Simply sauté a little shallot, toast your rice and orzo, pour a combo of broth and water over top and cook just like regular ol’ steamed rice. And voila, you’ve got homemade pilaf on the table in just about the same time it takes to cook up the stuff from a box! 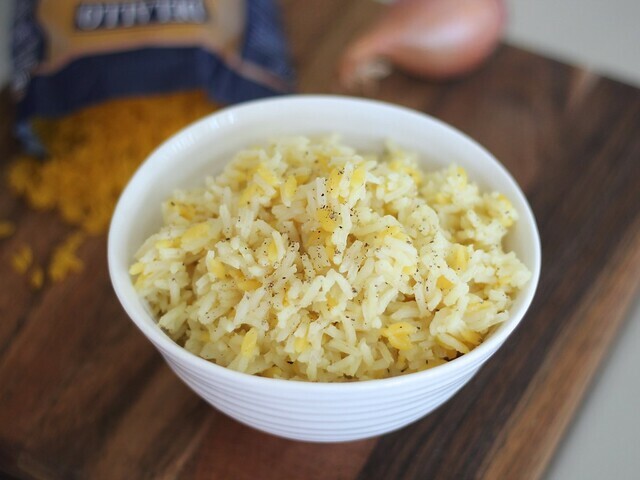 This recipe easily doubles, just be sure to increase the size of the saucepan that you cook the shallot-orzo-rice in to a medium size one (4-quart). For a vegetarian-friendly version, swap your favorite vegetable stock for the chicken broth. Combine chicken broth and water in a saucepan (1- to 2-quart), set over high heat and bring to a boil; keep warm. While broth-water mixture heats, set small saucepan (2-quart) over medium heat; add oil and warm until shimmering. Stir in shallot, and cook, stirring occasionally, until shallot is softened and lightly browned in spots. Stir in orzo and rice, and cook for about 1 minute, stirring often, until slightly toasted. Pour hot broth and water over top, stir well, increase heat to high and bring to a boil. Once it reaches a boil, stir, cover, reduce heat to low and cook for 20 minutes or until the water is nearly all absorbed. Remove lid, fluff rice, and re-cover. Allow to rest for at least 5 minutes before re-fluffing and serving.